Updated: August 2016 – Letter from the Hume Springs Citizens Association regarding their 2016 National Night Out. 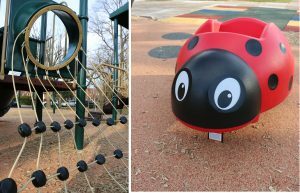 In September 2015, RunningBrooke partnered with the City of Alexandria and the Hume Springs Neighborhood Association in our most ambitious playground renovation to date, completely revitalizing the Hume Springs Park Playground in Arlandria. This playground was fully funded by over 400 generous donors during Spring2ACTion 2014 — thank you to all donors and volunteers who turned this dream into a reality for countless Alexandria children! And thanks to our park sponsors: Rebuilding Together Alexandria, The Brickman Group, Simpson Development, The Rotary Club of Alexandria, Carshalton Park Rotary of Carshalton Park England and Rosemont Landscaping & Design. Activities include: an Arch Swing and Tot Seats, Log Tunnels and Climbers, Slides and Bridges, Lady Bug and Bumble Bee Riders, Butterfly Gardens with native plants, Shade Trees, and Benches for tired parents and caregivers! Notice the open space for community events, and quiet spots for reading. 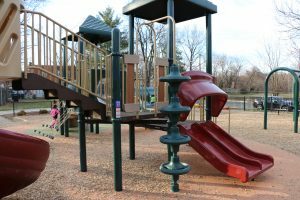 Watch the video below to see how RunningBrooke worked with the City of Alexandria Department of Recreation, Parks & Cultural Activities, Rebuilding Together Alexandria and the Hume Spring Playground neighbors to understand the needs of the community and the children in it.